In the AptaCheck project, we optimize, validate, and mature for commercialization our patented, innovative point-of-care (POC) platform technology, the AptaSystem®, which is intended for detection of infectious microorganisms. 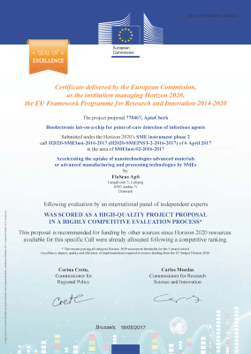 Solsten Diagnostics A/S was granted the Seal of Excellence and EUR 2,254,187.50 for the AptaCheck project (GA. 783750) within the framework of Horizon 2020 SME Instrument Phase II projects (H2020-SMEInst-2016-2017/H2020-SMEINST-2-2016-2017). In the Innobooster project, we are focusing on the challenging industrial production of the high-precision AptaChip®. Our activities comprise optimization of the production processes and development of new methods to ensure the robustness and quality assurance of the AptaChip® production, including the production of the tiny electrodes and their functionalization. Solsten Diagnostics A/S has been granted EUR 99,340 from Innovation Fund Denmark for this project no 7041-00136B. Dr. Iordanis Arzimanoglou was the appointed EIC-SME Instrument Business Innovation Coach for Solsten Diagnostics A/S after the company received the Horizon2020 funding. With his industrial experience, Dr. Arzimanoglou provided great value for the company by presenting the tendencies in the diagnostic market and by advising in the company´s future strategy.